Minneapolis skyline from Bryn Mawr Park, 2004-11-24. 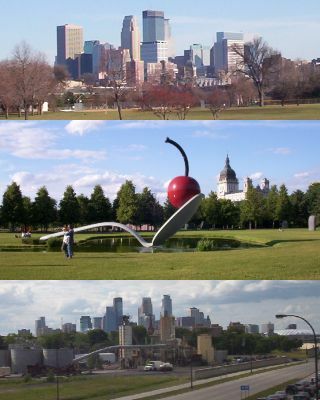 Spoonbridge and Cherry, Minneapolis Sculpture Garden, 2004-06-26. Minneapolis skyline from the LRT bridge over Hiawatha Ave., 2004-06-26. Hello. I am Aaron of Minneapolis. Welcome to my homepage. I was born in 1982 and I live in a southwestern suburb of Minneapolis, Minnesota, USA. I like Star Trek, science, history, math, Robert E. Howard's stories, Isaac Asimov's science essays, and The Sims. I hope you like what I have here. "Barbarian" by Pål Lövendahl. Used with permission. See Pål's other art on Elfwood. The original USS Enterprise NCC-1701 (Kirk's ship). 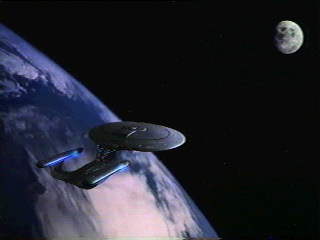 The USS Enterprise NCC-1701-D (Picard's ship) orbiting Earth. Aaron's Sims Page. Objects and skins for The Sims. Essay about Asperger Syndrome. This essay discusses how Asperger Syndrome affects me. Virtual Worlds. My life in several virtual worlds. Loincloth Pages. Pages about my loincloth interest. Includes How to put on a one-piece loincloth, a photo tutorial I made back in July 2007, originally posted in a few loincloth-related Yahoo groups. Banners Page. Feel free to use the banners on your site's Links section. 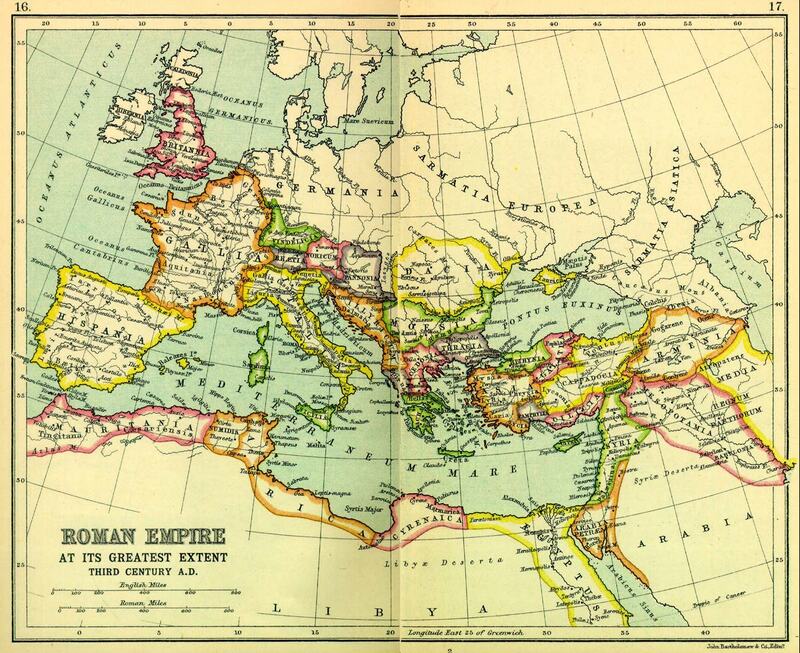 Map of the Roman Empire at its greatest extent (3rd Century A.D.). A map of the Roman Empire that I found online somewhere long ago. It has the Roman names for all of the cities, provinces, seas, physical features, etc. on it. Miscellaneous Directory. Contains various items that didn't seem to belong elsewhere. Feel free to check it out. 2010-09-08 -- Added a site map. 2010-07-16 -- New tutorial: How to put on a breechcloth. Find it in the Loincloth Pages section. 2010-07-11 -- I removed the old guestbook pages. They don't really serve a purpose any more. 2010-03-17 -- New Virtual Worlds section! It replaces my old There and Second Life page. My LiveJournal blog and profile. Updated irregularly. My Yahoo! profile. Has some basic info. Elfwood Fantasy Art Gallery. A huge site of amateur fantasy and sci-fi art. The Barbarian Keep. A very good Conan and barbarian info site. www.simcity.com . Maxis's official SimCity series website. www.startrek.com . Paramount's official Star Trek site. This site contains information on every Star Trek character, episode, and movie, as well as information on Klingon culture, stardates, chronology, and lots of other things. Also contains Star Trek community resources, as well as public chatrooms. Memory Alpha. The Star Trek wiki encyclopedia. It's like Wikipedia for the Star Trek universe. The Darwin Awards. From their website: "The Darwin Awards honor those who improve our gene pool... by removing themselves from it." Worth a look. Plus, they have a book out (actually three books) as well. Steve Riner's Unofficial Minnesota Highways Page. Everything you've ever wanted to know about Minnesota's highway system (and tons more you didn't even think of asking about). U.S. Highways. Information about every U.S. Highway that has ever existed. Froggie's Twin Cities Highways Site. Details on all freeways and major highways in the Minneapolis - St. Paul area, including exit lists. Matt Salek's Upper Midwest Freeway Exit Guides. Exit lists for freeways in outstate Minnesota and Wisconsin. KLS: The Loincloth Site and The Loincloth Message Board. A site and message board about loincloths. I've always thought loincloths were cool, and my discovery of this site (and a few Yahoo groups) rekindled that interest back in 2004. WoWWiki. A Warcraft-universe wiki, focusing mainly on World of Warcraft. Wowhead. A World of Warcraft database. Contains information on items, quests, NPCs, talents, etc. Evidence for Jury-Rigged Design in Nature. Some collected posts from the talk.origins newsgroup, showing how evolution doesn't always choose the best solution, but instead chooses any solution that works, no matter how weird or illogical it is, provided that it does more good than harm, at least in the short term. The Amazing "Send Me A Dollar" Website. If you feel like it, you can send this guy $1 (cash via snail mail, or through PayPal! ), and receive absolutely nothing for your non-tax-deductable donation. :-) Also contains comments from people who sent in dollars, and a rated list of other "send me money" sites. An amusing site, worth a visit. AssMan's Internet Poopstain. My brother's website. WARNING! Not work safe! Also, my brother used to play bass in a small rock band with two of his friends, called Fustigated. Warning! This site not for the easily offended! The Science Museum of Minnesota. My local science museum, located in downtown St. Paul, Minnesota. They have dinosaurs, human body gallery, hands-on experiments, an Omnitheater/IMAX thrater, and more. They moved into a great new building on the riverfront in late 1999, so if you're ever in town, feel free to check it out. 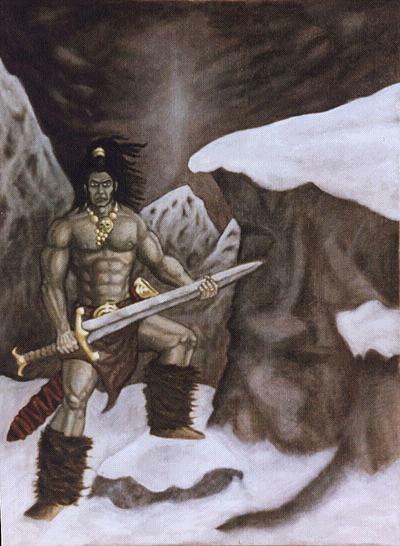 Conan the Barbarian WebRing. A Web Ring of Conan sites. The Barbarian Keep is a member of this ring. Someday, when I get around to it, I might list my site there. Where's George?. The dollar bill locator. If you get a bill with www.wheresgeorge.com written on it, please go to that site and enter that bill's denomination, series, and serial number, and the zip code you're in when you're entering the bill. You can also become a registered Where's George user (for free) and enter bills that haven't been entered before -- just make sure you write www.wheresgeorge.com on them before you enter them. Homepage of Tonan the Wayfarer. The defunct website of an interesting barbarian. 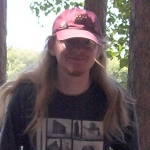 If you're looking for renfaire pictures or Conan insults, he's got 'em. (Pics here, descriptions here.) Accessible only through the Wayback Machine since AOL Hometown closed. Lucky's World. Lucky is Acting Archon of Washington D.C. and Virginia in the Capitol Chronicles, part of a vampire RPG. The Chronicles can be quite interesting, so be sure to check this site out. Rebecca's Castle. The homepage of someone I used to know know online, who was also a member of the now-defunct Gulmaram's Queendom. Not very prestigious awards, though. Last updated Wednesday, September 8, 2010 (2010-09-08). Created on GeoCities on February 16, 1999 (1999-02-16). Moved to aaronofmpls.com on September 9, 2009 (2009-09-09).